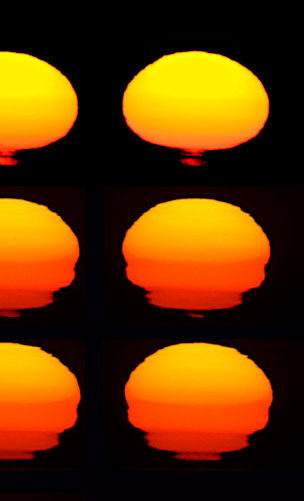 Sunset mirages, two or more images of the sun, are seen when its low slanting rays are unusually refracted between air layers of different temperature. Usually the air temperature falls smoothly with increasing height. The most we then see is a slightly flattened sun. A mirage needs more severe temperature variations. One class of mirages, M-Mir sunsets,occur when there is a temperatureinversion – warm air overlays cooler layers. The sunset mirage at left was produced by multiple inversions. Another sunset mirage form, Jules Verne called it an “Etruscan vase”, occurs when the sun-warmed afternoon sea produces an abnormally hot air layer close above its surface. Miraged suns often presage the elusive green flash!